College students hear it all the time. From the freshman fifteen to spring break beach body anxiety, fat talk has become a fact of life in the college lifestyle. Every year, however, women all over the world come together to celebrate their bodies and take the pledge to ban fat talk. Fat Talk Free Week, an international campaign to banish negative body talk, is typically celebrated in the month of October, with an emphasis on the third week in the month. The pledge that participants are encouraged to take states: “Today I promise to end Fat Talk in conversations with my friends, my family and myself. Starting now, I will strive not for a thin-ideal but for a healthy ideal, which I know looks different for every person, and focuses on health not weight or size. I will celebrate the things about myself and the people in my life that have nothing to do with how we look,” according to endoffattalk.org, where students all over can digitally sign the pledge. Colleges across the nation use the campaign as a way of enforcing positive body image on their campuses. The prevalence of eating disorders on college campuses is nothing new. According to the National Association of Anorexia Nervosa and Associated Disorders, 95 percent of all women with eating disorders are between the age of 12 to 25.8, and 25 percent of college-aged women have used binging and purging as a method of weight control. Only 5 percent of American women naturally have the type of body the media tends to idolize, according to ANAD. Eating disorders are harmful not only to women’s self-esteem, but to their health and safety as well. Eating disorders are the mental health disorders with the highest death rate. About 20 percent of women suffering from anorexia and eating disorders will die as result of them, from complications such as heart and organ failure, malnutrition and suicide, according to ANAD. 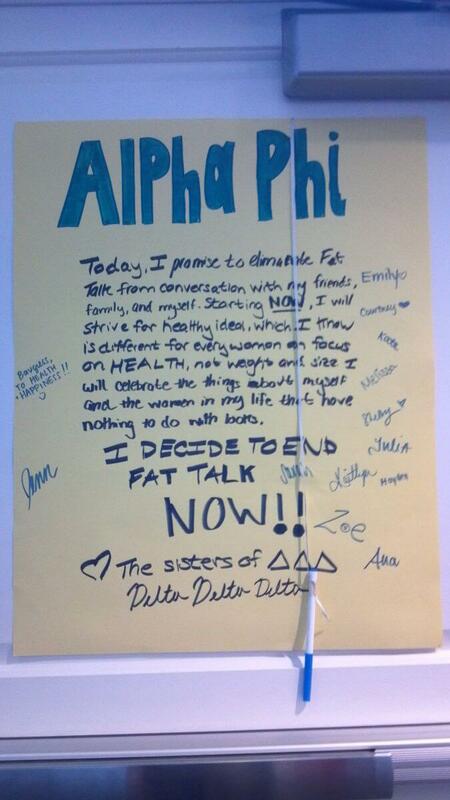 To embrace the campaign’s message, several college campus groups across the nation host Fat Talk Free Week events. Every year, each participating school comes up with unique ways to promote the campaign. 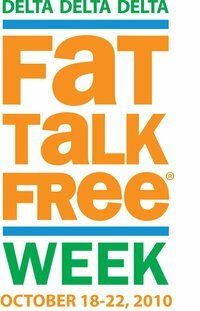 Illinois State University’s Campus Recreation and Student Counseling Services will work together to bring students two Fat Talk Free Week events. The first, on Oct. 22, is a “trash your fat talk” Zumba class. On Oct. 23 they hosted “Be-You-Tiful,” a turbo-kick class and personal training session and “Myth-busters: Fitness Edition:” a workshop designed to bust common misconceptions about exercising and dieting, according to their website. In 2010, Rutgers participated in the program by setting up “inspiration stations” around their campus run by students and the Rutgers Nutrition Advocates, which provided students with information on healthy eating habits and the chance to sign the no fat-talk pledge, according to their website. This year the University of New Hampshire is implementing inspiration stations in their celebration of Fat Talk Free Week during this week, as well as events such as online support chats and a life-sized Barbie. UNH’s Dimond library will showcase a Barbie throughout the week that demonstrates what she would look like if she had the proportions of a real woman, according to its website. Last year, Scripps College put on several events throughout their third-annual Fat Talk Free Week, the theme of which was “Embrace EveryBODY.” Scripps’ Tiernan Field House and Resident Advisors associations sponsored the campaign, which included events such as a punching bag to “punch out negative thoughts” and an “operation beautiful” wall where students could write positive messages to inspire one another, according to their website. Participating schools have recently made the campaign’s message even more accessible to students by promoting apps that they can download to help spread the message. Stockton College participants are encouraging their fellow students to utilize the Body Beautiful App, which relays positive quotes, articles, videos and tools regarding body image. The app can be purchased through the Apple store for 99 cents. To Burp Or Not to Burp: Revealing Weird Habits to your S.O.